I’m currently sitting a bagel shop drinking my second coffee of the day and reading a new report called Healthy Food Healthy Communities: Promising Strategies to Improve Access to Fresh, Healthy Food and Transform Communities. This report by PolicyLink discusses in considerable depth the issues of obesity, for both adults and children, and the relationship between obesity and lack of adequate healthy food options in low-income neighborhoods. Some background: Obesity in the US (and worldwide) is reaching epidemic proportions. One in three adults is obese and approximately 17% of children and teens are obese (Center for Disease Control and Prevention). 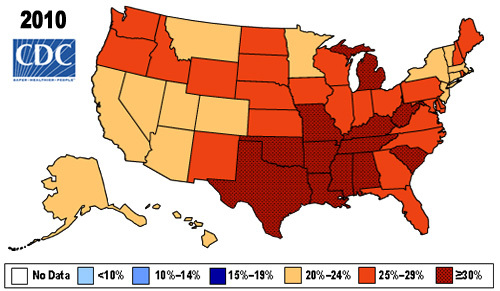 The two images copied below show the percent of adults in each state that are obese (BMI > 30). The first image is from 1990. 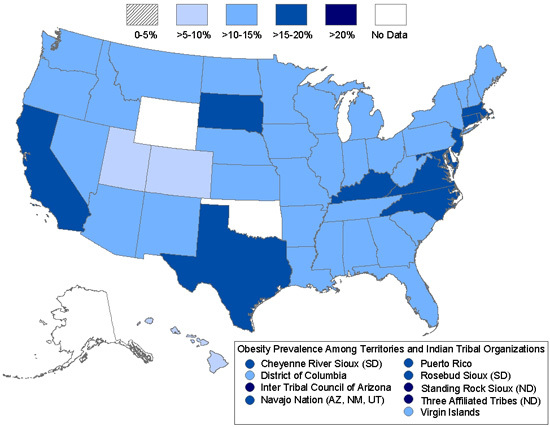 All states were either blue or light blue which means that 10-14% of the adult population in each state was obese (white indicating no data). If you look at the second image (2010), you see that nearly the entire country is red, orange, or yellow- meaning that in every state in the US, more than 20% of the Adults are obese and in many states, more than 30% of the adult population is obese. Click this link to see all other years obesity rates per state. While the adult obesity epidemic is troubling the childhood rate is heartbreaking. Look at the equivalent charts of childhood obesity in the US. 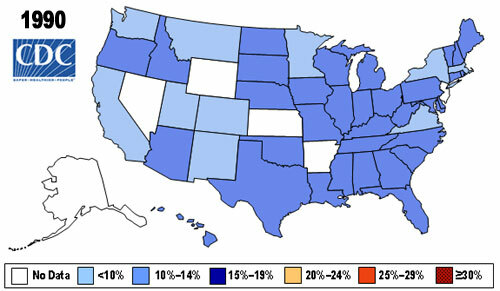 Here the light blue states have rates between 10-15% and the dark blue states have obesity rates between 15-20%. Click this link for larger image. The Healthy Food Healthy Communities: Promising Strategies to Improve Access to Fresh, Healthy Food and Transform Communities report focuses on the communities in our country that are particularly susceptible to obesity and other related health issues. The graphs above demonstrate that obesity is a nationwide issue but low-income communities are particularly vulnerable to obesity. A recent concern for low-income communities is the lack of healthy food options in their neighborhoods: there are fewer supermarkets and places to buy healthier foods in low-income communities than in wealthier ones , this is also the case for Latino and African-American areas compared to predominately white areas. The report offers solutions that will lead to increasing access for healthy food for populations who currently have limited access. Some of the recommendations and solutions that are already in place in some communities include: The Fresh Food Financing Initiative, an initiative that provides loans and grants to encourage food retailers to locate in underserved low-income communities and provide fresh food to customers, improve small stores, increase grocery store access in low-income neighborhoods, and increase access to farmers markets. Teaching young children to select “better for you foods” is one way to decrease the obesity rates in this country, but if youth do not have the opportunities to purchase more fresh, healthy, and “good for you foods” the educational benefit of learning to eat healthy will be wasted. This report provides crucial information for policy makers, business owners, and the general public about the issues related to lack of health food choices in America.